Cancer patient Debra Meehan-Lint wears the DigniCap at Sparrow Hospital's Herbert Herman Cancer Center. After asking about their course of treatment and how likely it is that it will succeed, many cancer patients have another question: will I lose my hair? Sparrow Hospital has begun using a new process that aims to prevent the hair loss that often accompanies chemotherapy. 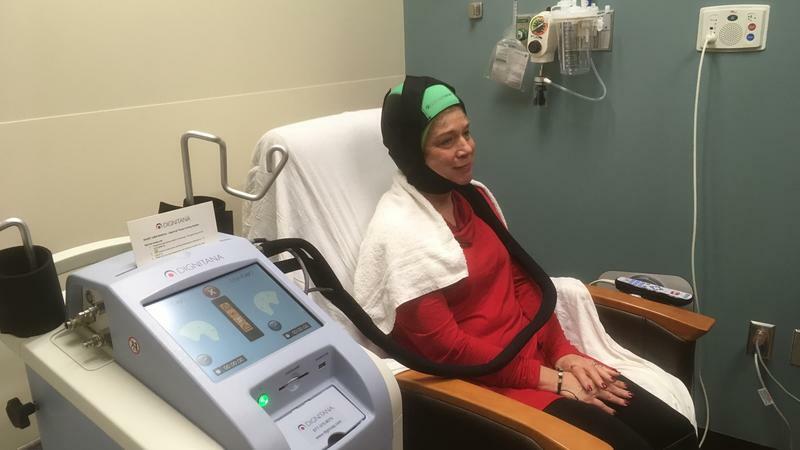 WKAR's Scott Pohl reports on how DigniCap therapy can help cancer patients keep their hair. Debra Meehan-Lint of Norton Shores knows her way around cancer treatments. She’s lost two husbands to cancer in the last five years. So, when she was diagnosed with stage one breast cancer in January, she underwent a lumpectomy and is following a course of treatment that the 61-year-old hopes will reduce the likelihood that her cancer will return. And like many people, she hopes her hair won’t fall out. It’s her hope that Sparrow’s new DigniCap will help. "There is a 30-percent chance that I would lose my hair permanently," she explains, "and that would be a biggie for me. That would bother me." The name DigniCap might be fitting in that it’s a cap that can prevent the indignity of hair loss. Coolent circulates through the cap to reduce the temperature of the scalp during chemo. Breast surgeon Dr. Timothy McKenna is medical director at Sparrow’s Multidisciplinary Breast Cancer Clinic. He says chemotherapy interferes with cell duplication. "Hair cells are turning over about as quickly as any cell in the body," Dr. McKenna continues. "Chemotherapy then has the most effect on cells turning over, such as cancer cells which are growing, and hair cells. It's basically a victim of our chemotherapy regimen." This treatment isn’t covered yet by insurance, but the Sparrow Foundation’s Women Working Wonders, or W3, committee, is helping defray the expense, according to chairperson Janet Freund. 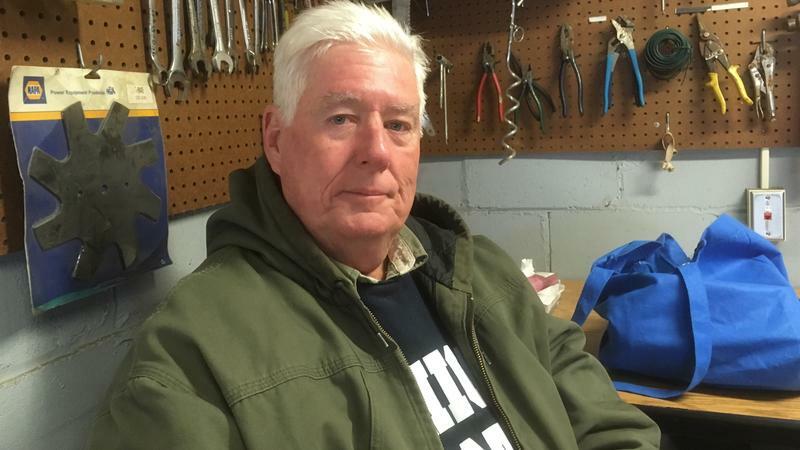 "Even though it's not just a women's issue, everyone wants to keep their hair during chemotherapy, but it was first approved for breast cancer, which primarily affects women," states Freund. "We just thought this was a wonderful tiein to our mission." The people at Sparrow’s Herbert Herman Cancer Center say this is the only DigniCap treatment available in mid-Michigan. Melanoma is a dangerous form of skin cancer, claiming 10,000 lives every year in the United States. 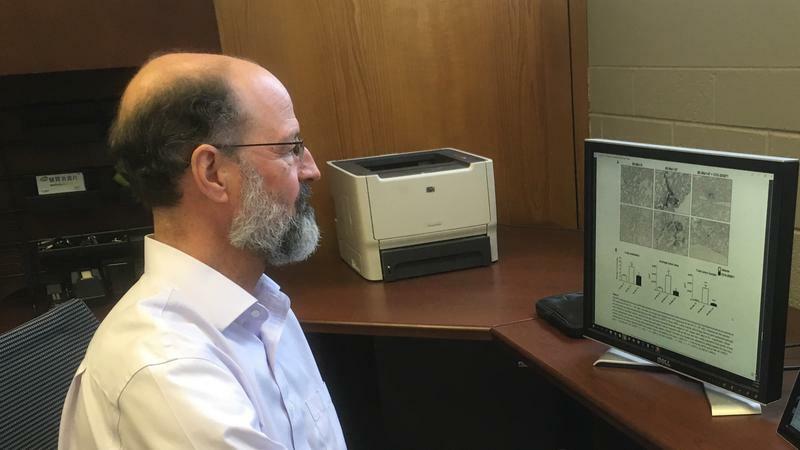 Research now underway at Michigan State University has focused on a potential new drug that could reduce the spread of melanoma cells by up to 90-percent. WKAR's Scott Pohl reports on melanoma research underway at Michigan State University.